Blurb: Four years have passed since Evvy left the streets of Chammur to begin her training as a stone mage. At fourteen, she’s unhappy to be on a new journey with her mentor, green mage Rosethrone who has been called to the Battle Islands to determine why the plants and animals there are dying. Evvy’s job it to listen and learn, but she can’t just keep quite and do nothing. With the help of Luvo, the living stone heart of a mountain, Evvy uncovers an important clue. Now, with the island on the brink of disaster, it’s up to Evvy to avert the destruction that looms ahead. 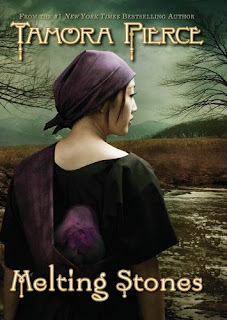 Review: I have to say that this was my least favorite of the Tamora Pierce collection. I thought that after the wonderfully in depth character of Beka Cooper from Terrier Evvy was a bit of a let down. If you are not interested in long explications of rock types or rather self main characters then this is not the book for you. However, it was nice to know what happened Rosethorn after the Circle books and while it is not necessary to read the Circle books first, I do advice it for then you will have more of a reason for pushing on with Melting Stones. Of all the characters, my favorite was Luvo, the living stone heart of a mountain because he gave me the most satisfaction as he was able to show up some of the less intelligent characters. Without him, the novel would definitely have fallen short of expectations, as it is, I don’t think this novel will be on my bedside table again in the near future.